A public WiFi service is to be installed in the centre of Inverness. Busy areas including Falcon Square and the Victorian Market will benefit from the internet access. The project is the one of the first to benefit from funding from the Inverness City Region Deal. The project is drawn from a £3million advance on the wider £315million package. Business leaders in the city centre last night welcomed the project. 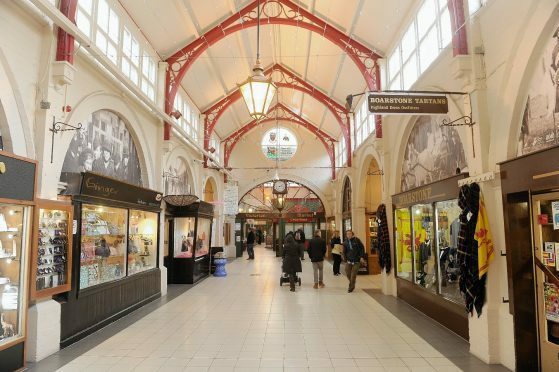 The council revealed progress after plans were lodged to install equipment for the WiFi on the city’s Victorian Market. Planning permission is needed for the scheme because of the market’s B-listed status. An external antenna unit would be mounted above the market’s famous facade on Academy Street, with four further transmitters inside the building. Inverness Bid manager Mike Smith welcomed the project, saying businesses had been kept up to speed with regular briefings. He said: “It’s certainly something we would support and we hope the pilot project is a success. The area covered by the internet access will stretch from Falcon Square along Academy Street and will take in the market, Union Street, Queensgate and part of Church Street. A Highland Council spokeswoman said: “The council is planning to install free city WiFi as part of a pilot project in a defined area of Inverness, including the Victorian Market. “The project will begin later this year, before Christmas and is funded by city region deal money. “The project will be launched later in the autumn. The council revealed earlier this week that they have submitted business cases for projects worth around £48million as part of the city deal. Among them is plans for remediation work at the former Longman landfill in order to create a large new business park, potentially creating more than 2,000 jobs over the next 10 years. The council has also set a £15million case for turning Inverness Castle into a tourist attraction.